Polycarp, this great apostolic man, was born a pagan. 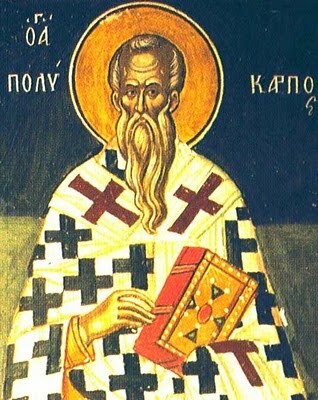 St. John the Theologian converted him to the Faith of Christ and baptized him. In his childhood, Polycarp became an orphan and according to a vision in a dream Callista, a noble widow, took him as her own son, raised and educated him. From his childhood Polycarp was devout and compassionate. He strove to emulate the life of St. Bucolus, then the Bishop of Smyrna, as well as the Holy Apostles John and Paul, whom he knew and heard. St. Bucolus ordained him a presbyter and before his death, Bucolus designated him as his successor in Smyrna. The apostolic bishops, who gathered at the funeral of Bucolus, consecrated Polycarp as bishop. From the very beginning, Polycarp was gifted with the power of working miracles. He expelled an evil spirit from the servant of a prince and through prayer stopped a terrible fire in Smyrna. Upon seeing this, many pagans regarded Polycarp as one of the gods. He brought down rain in times of drought, healed illnesses, discerned, prophesied and so forth. He suffered during the reign of Emperor Marcus Aurelius. 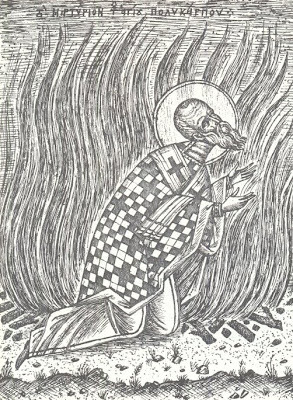 Three days before his death, St. Polycarp prophesized: "In three days, I will be burned in fire for the sake of the Lord Jesus Christ!" And on the third day when the soldiers arrested him and brought him to trial, he cried out: "Let this be the will of the Lord my God." When the judge counseled him to deny Christ and to acknowledge the Roman gods, Polycarp said: "I cannot exchange the better for the worse!" 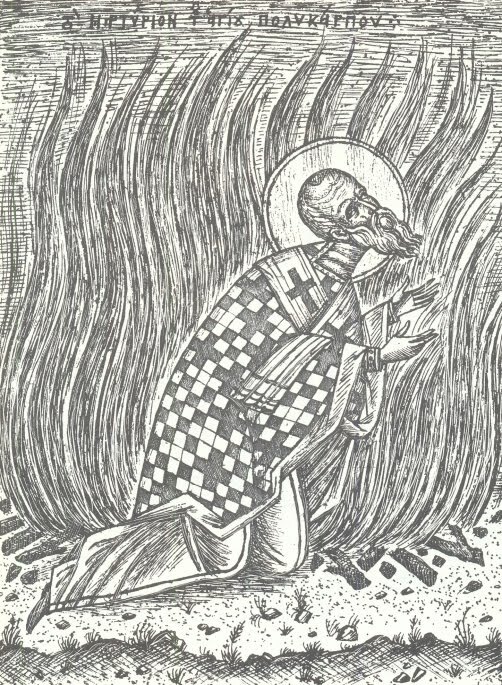 The Jews especially hated Polycarp and endeavored to have Polycarp burned alive. 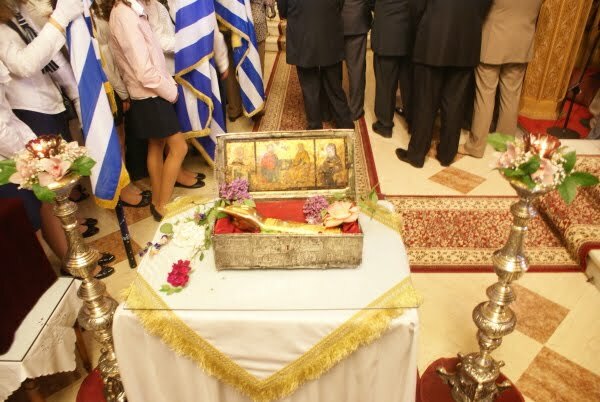 When they placed him bound at the stake, he prayed to God for a long while. He was very old, grey and radiant as an angel. The people witnessed how the flame encircled him but did not touch him. Frightened by such a phenomenon, the pagan judges ordered the executioner to pierce him with a lance through the fire. When he was pierced, so much blood flowed from him that the entire fire was extinguished, and his body remained whole and unburned. At the persuasion of the Jews, the judge ordered Polycarp's lifeless body be incinerated according to the custom of the Hellenes. So the evil ones burned the dead body of the lifeless one whom they could not burn while alive. St. Polycarp suffered on Great and Holy Saturday in the year 167 A.D.
St. Polycarp writes the following to the Philippians about a priest Valentine who fell into the sin of avarice and secretly hid money belonging to the church: "I was deeply saddened because of Valentine who, at one time, was a presbyter among us, who had forgotten the rank [the priesthood] bestowed upon him. That is why I beg you, beware of greed and remain pure and just. Restrain yourself from every vice. He who cannot restrain himself, how will he be able to teach others restraint. He who submits to avarice pollutes himself with idolatry and numbers himself among the ranks of pagans. Who is not aware of God's judgement? As Paul teaches: 'Do you not know that the saints will judge the world?' (1 Corinthians 6:2). In other words, I have not noticed anything similar among you neither have I heard anything among you; among those whom Blessed Paul lived a life of asceticism and about whom he speaks with praise at the beginning of his Epistle to the Philippians. He boasts of you throughout the churches, which, at that time, knew God, and we did not yet know him, [i.e., Polycarp and the inhabitants of Smyrna]. Brethren, that is why I am very saddened because of Valentine and his wife. May God grant them true repentance. 'And you, be prudent in that and `not count him as an enemy' (2 Thessalonians 3:15), but endeavor to correct them as suffering and prodigal members, that your entire body be sound. Acting thusly, you build yourselves up." Thus, the saints dealt with sinners: cautiously and compassionately; cautiously to prevent others from a similar sin and compassionately in order to correct and save sinners. Until they complete their task, they perish not. In a road inn, spent the night. The Elder prays while the deacon sleeps. For the inn is soon to be destroyed. But the deacon fatigued, slept on. One moment he awakes, the next moment he is drowned in sleep. And a warning he issues for the third time. But a warning from God, verily. And from the road inn, walked out. Because of certain kinds of secret transgressions. But in prayer, the saint was silent. They continued their way, under the stars. As a sharer of the ways and a successor to the throne of the Apostles, O inspired of God, thou foundest discipline to be a means of ascent to divine vision. 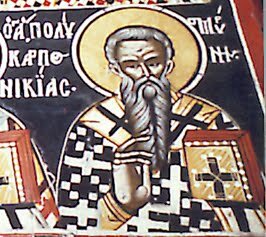 Wherefore, having rightly divided the word of truth, thou didst also contest for the Faith even unto blood, O Hieromartyr Polycarp. Intercede with Christ our God that our souls be saved. 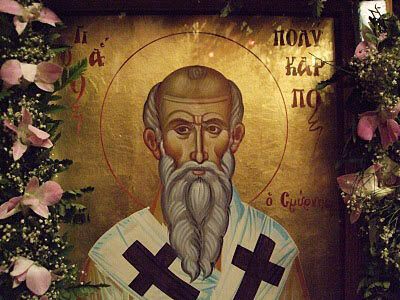 Through godly virtues, thou broughtest forth for the Lord God much spiritual fruit, O thou most blessed Hierarch, and so didst prove worthy of God thy Lord, O wise Polycarp. Wherefore, on this day we who have all been enlightened through thy holy words extol thy praiseworthy mem'ry and glorify Christ the Lord.